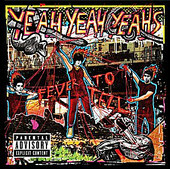 Brooklyn's spastic, chaotic, and seemingly unpredictable threat the Yeah Yeah Yeahs deliver a stellar indie record with Fever To Tell. However, an indie label it is not on. Rather, it's on the major Interscope Records. And, though nary a hit will be found on here, what you will find is unabashed, guitar-drenched, scream filled moments of straight-ahead garage rock, brass knuckle-kissed rhythms, and a throwback to the original days of CBGBs - piss and vinegar, loose, in-your-face rock 'n' roll that makes no excuses. Again, there isn't a hit here, so no clue why a major would even touch it (except for the fact the record oozes with coolness), but there is a lot of solid rock 'n' roll to get your blood boiling and Friday night started. I'll give it a B-.